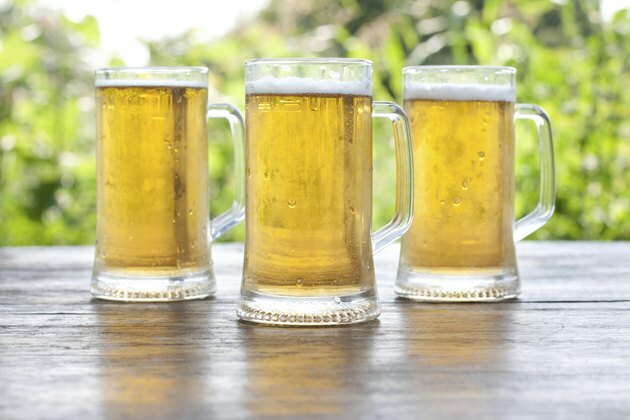 If you're craving a cold beer but don't want to consume the alcohol, you could choose a non-alcoholic beer. Brands like Kirin, Paulaner, St. Pauli, MillerCoors and Anheuser-Busch feature non-alcoholic beer choices. In the U.S., non-alcoholic beers must have less than 0.5 percent alcohol by volume. The Japanese non-alcoholic beer Kirin FREE claims that it is "the world's first 0.00%, completely alcohol free beertaste beverage" and contains 37 calories per 11.3-ounce bottle. Paulaner, a German beer brand, brews Thomas Bräu Non-Alcoholic Brew, which has about 86 calories per 11.2-ounce bottle. St. Pauli Non-Alcoholic has 96 calories in each 12-ounce bottle. MillerCoors sells Sharp's, a non-alcoholic beer that contains 58 calories per 12-ounce serving. Anheuser-Busch's non-alcoholic brew is called Busch NA and has 60 calories in a 12-ounce serving.